There’s a new chapter being written for two SoCal mountain lions that were found almost three years ago under a car in Burbank. Remember them? The two cubs (about three months old) were found under a parked car in early December 2011; residents were poking broomsticks to shoo them away before animal control rescued them. 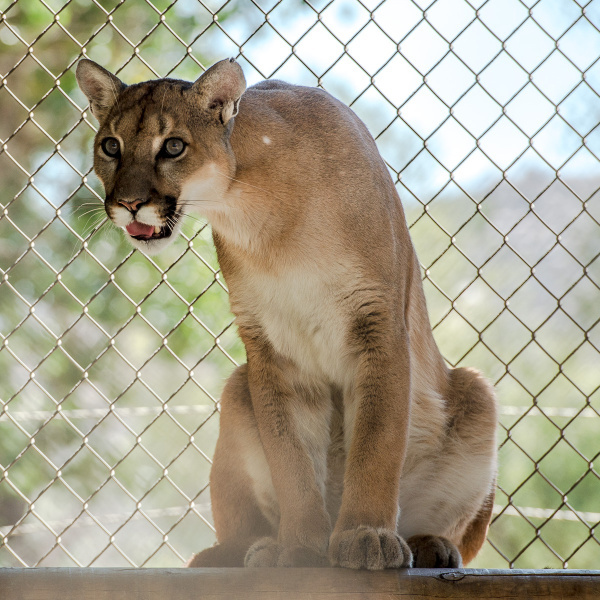 The young cats – horribly malnourished and full of parasites – were first taken to the California Wildlife Center in Calabasas for medical evaluation before being transported to Zoo to You, a sanctuary in Paso Robles. 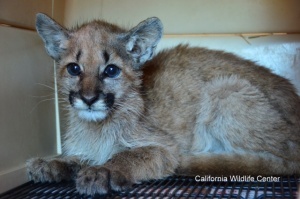 ONLY 3-MONTHS OLD — These mountain lion siblings were found wandering the residential streets of Burbank. NOT IN BURBANK ANYMORE – The lions have seen their share of the SoCal landscape. Photo courtesy of Zoo to You. RESCUED IN TIME — The cubs were found full of parasites and horribly malnourished. 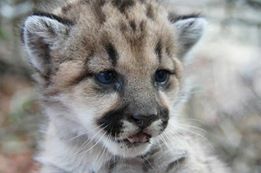 Photo courtesy of the California Wildlife Center. GOOD TRAINING — Olive responding to positive reinforcements at Zoo To You. Photo courtesy of Zoo To You. That’s when the folks at Animazonia stepped into the picture. 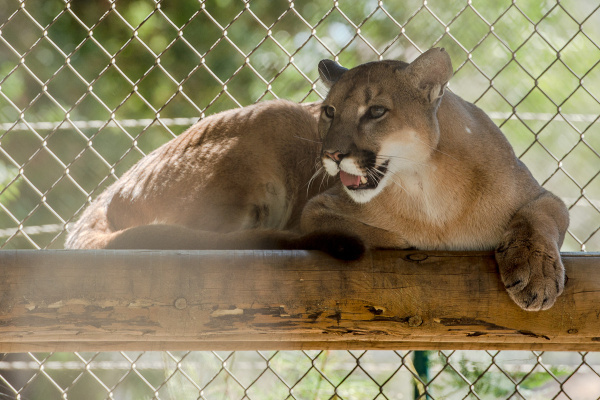 A sanctuary in Riverside, Animazonia Wildlife Foundation has been welcoming big cats to its grounds since 1986; it’s been a non-profit entity since 2000 and is operated entirely by volunteers, many who live in the Los Angeles area with fulltime careers. Three people do live at the sanctuary property. 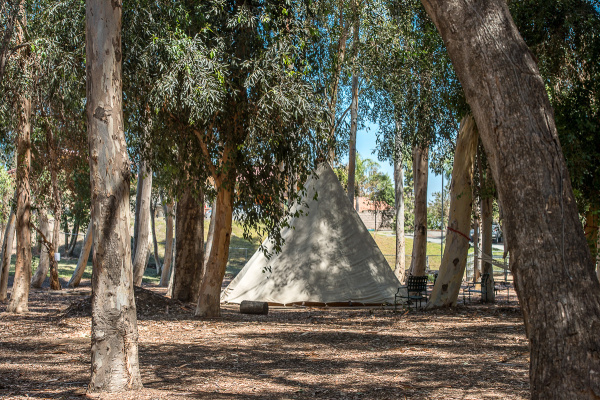 PEACEFUL AND GREEN – The former Burbank mountain lions have a verdant address at Animazonia. Since its inception, the 5-acre bucolic facility has been home to lionesses, mountain lions, a black leopard and a tiger. These animals were either confiscated from roadside zoos or kept as pets in private homes. 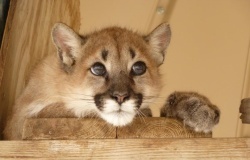 The Foundation started when volunteers, upset by an ad in the Recycler for an “Idaho cougar, 6 weeks, male. 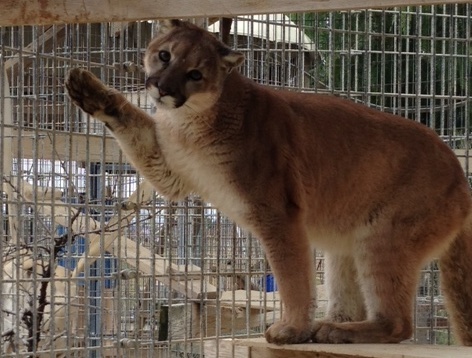 $600,” decided to rescue that mountain lion and thus began the search for an appropriate sanctuary. Overall, many of the big cats that find a home at Animazonia have been sick, neglected, abused or abandoned. But not so with Olive and Leno. At this point in their lives, their needs were clean cut: a place they could enjoy an outdoor life and simply be for the rest of their lives. “We had just lost our black panther Magic, she lived with us for 23 years,” said Anne Absey, board member and volunteer. When Absey and fellow board members heard about Olive and Leno’s situation earlier this year, they jumped at the chance to house them. A communication specialist in Glendale, Absey walks around the sanctuary, an oasis of shade and green in the Riverside chaparral and desert. 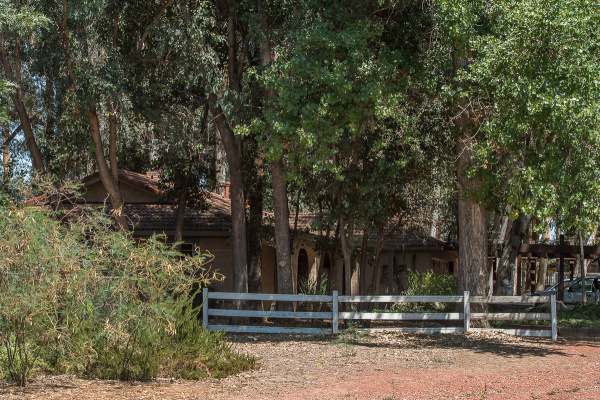 Big enclosures are scattered about the grounds, surrounded by tall eucalyptus trees, California pepper trees and a stand of cottonwoods, planted by volunteers. YUP, A TIPI — Animazonia plans on having overnight experiences for groups in the future. Adding to the peaceful surroundings is a nearby pond – filled with catfish and koi – that sparkles in the sunshine. The sanctuary is not generally open to the public, but small groups can arrange to tour the facilities. Currently, Olive and Leno are the only big cats housed at Animazonia; there is room for more. 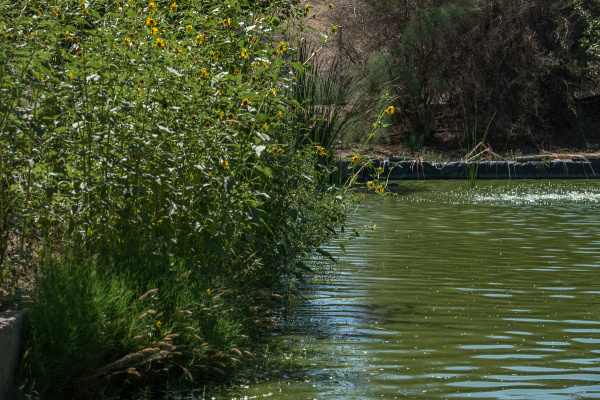 THE SOUND OF WATER – Is it too cliche to say that this sanctuary is an oasis? Absey walks over to Leno’s enclosure; the big cat seems relaxed but keeps a close eye on the new humans. “Oh this is good, he is on the ground,” says Serena Burnett who volunteers as animal caretaker, nutritionist and board member. She’s also a business owner and paralegal. “Usually, Leno’s been up high on his perch looking down. He seems very comfortable at this level.” Soon, however, Leno does jump back up to survey the situation. WHO ARE YOU? – Leno is suspicious (and curious) with new guests. Across the way, Olive looks ready for a nap but the unknown guests pique her interest. WHEN WILL THEY LEAVE? — Olive hopes she can soon return to her afternoon snooze. Burnett explains that at first Olive and Leno weren’t eating very much which caused concern. These cats in the wild normally eat at night, when they are more active, so feeding schedules were altered. But just how active are they in the dark of night? With the help of SoCal camera trapper and Cougarmagic blogger Johanna Turner, volunteers placed motion controlled cameras in each cage to record how the cats behave once the sun went down. The results were, (dare we say it?) night and day. Absey and Burnett share footage: Leno batting about toys (one is a bowling ball stuffed with catnip), stalking lizards and bounding up and over his perch. Olive, likewise, is on the prowl, alert and active; she has a toy made of old firehouses fashioned into a ball. The nighttime footage helped everyone breathe a collective sigh of relief. Here, Leno is playing with a log toy and does an acrobatic back flip off his perch. Animazonia’s upcoming fundraiser is in South Pasadena on Sept. 13, 2014 will fund needed improvements like a new outdoor restroom, cage roof top covering and landscaping as well as general expenses. It costs about $75,000 to feed these cats over the course of their lives at the sanctuary. 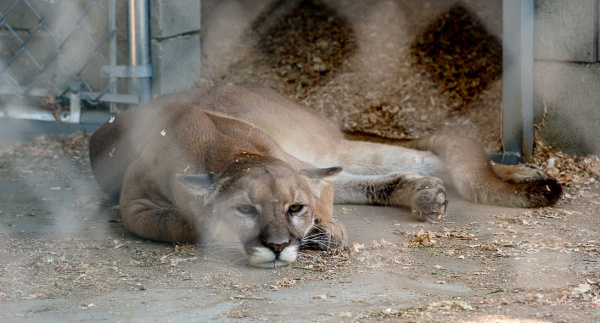 No doubt, the big discussions at the fundraiser will be about how the Burbank lions are handling this new chapter in their lives but also on the fate of urban mountain lions in Southern California. LIVING THE DREAM — Olive and Leno (pictured here) are kicking it back in their new digs.